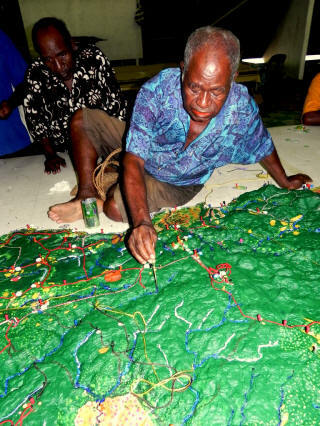 This 1:25,000 scale (5x vertical exaggeration) Participatory 3D Model of Manus Province, PNG, was completed in September, 2011. The model measures 2.6 m x 5 m and corresponds to an area of 8,125 km2 on the ground. 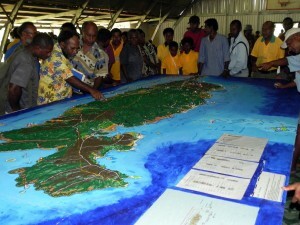 It has been the 2nd Participatory 3D Model constructed in Papua New Guinea. Nearly 100 participants carried out a ‘participatory 3D modelling’ (P3DM) training and activity. These men, women and youth were from every corner of Manus and its surrounding islands, from local community groups and community representatives, local NGOs and local government. Collectively, they created a large model (1:25,000 scale) of the province, and transposed their local knowledge of features and land-use changes, and interpreted maps and existing data, to provide a detailed, verified, geo-referenced living landscape of the province. With many of the national and provincial planners having joined the energetic model building efforts during the week, they were all formally invited to a final presentation by the P3DM participants. This gave a platform to present their view of Manus and discuss their perspective on requirements for current and future development plans (Hardcastle, 2011).